In your testing environment you may want to speed the process up. I'll show you how to force a client to get the package straight away and get a report on the outcome of the advertisement. 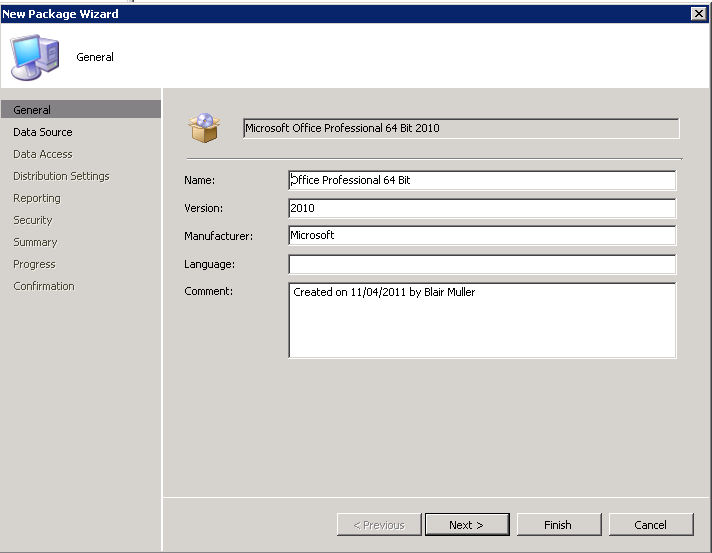 Download your Office 2010 install files and place it in your package source directory. Run setup.exe /admin from the command prompt. This will allow us to create a MSP file which we will save into the updates folder. 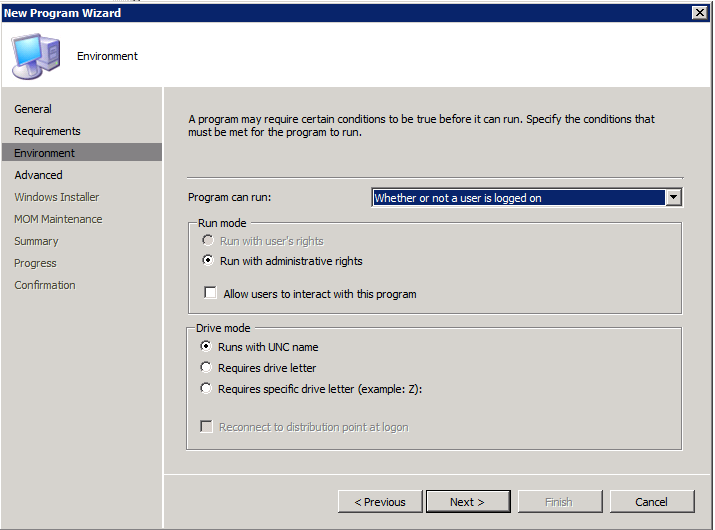 It is important to note you can only run setup.exe /admin for Office 2010 64 Bit version from a 64 bit platform. Complete your desired customisation. In this example, I will be completing the following: Setting the organisation name, setting licensing and user interaction (suppress all notifications to allow for a silent install) and removing previous installations. Go to File => Save As and save it in the Updates folder as Setup.MSP. Office looks at this location for updates and customisation files automatically. You can put Service Packs in this location too and they will be automatically installed during the Office install process. 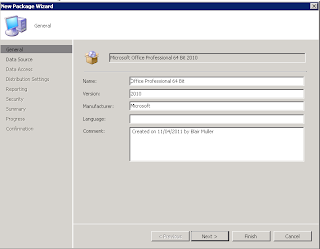 Your customised Office 2010 package is now ready for SCCM. File out the details as below. You can set program dependencies. In this example I will only install Office 2010 on Windows 7 x64 machines and the install process will timeout after 120 minutes. You can set the environment. Since it is a silent install I will install it whether or not a user is logged on, run with administrative rights and allow users to interact with the program. You can set some advanced features like running a program first. In this example I have left it as default. Under Package Status => <SiteCode> you can see the state of your package on each Distribution Point. It will state Installed once the package has completed copying. Within Active Directory create a security group. 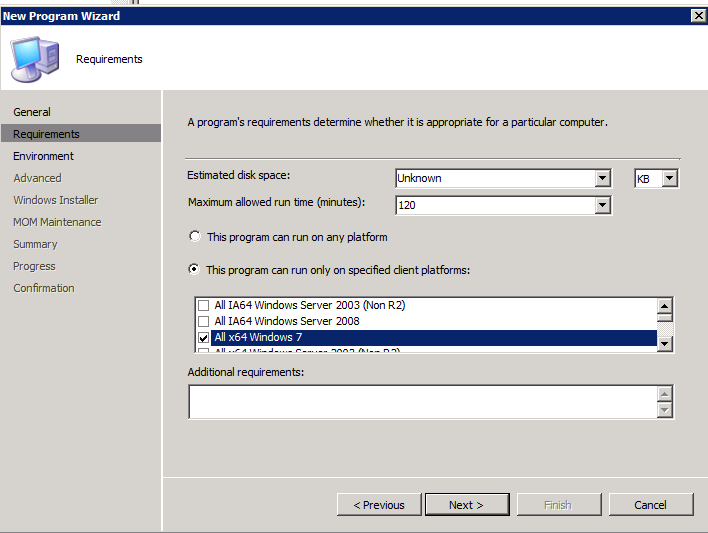 Call it SCCM - Deploy Microsoft Office 2010 Professional Plus x64. Create a new membership rule by clicking on the SQL button. Limit the Collection by your Active Systems Collection Group, give the query rule a name and click on Edit Query Statement. WHERE SMS_R_System.SystemGroupName = "CHANGE ME\\SCCM - Deploy Microsoft Office 2010 Professional Plus x64"
Click on OK twice and next three times and your collection is created. Set the Distribution Point settings. In this example the client downloads the package to their cache. Set user Interaction. In this example, I allow users to interact with the application to run it when they want to. If they don't run it, the application will install at the deadline. Click Next twice and you advertisement is created. 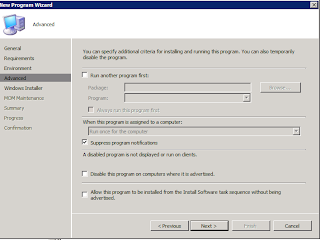 Your computer will get the new advertisement when it reports pack to your SCCM Server. To force the process follow the below instructions. 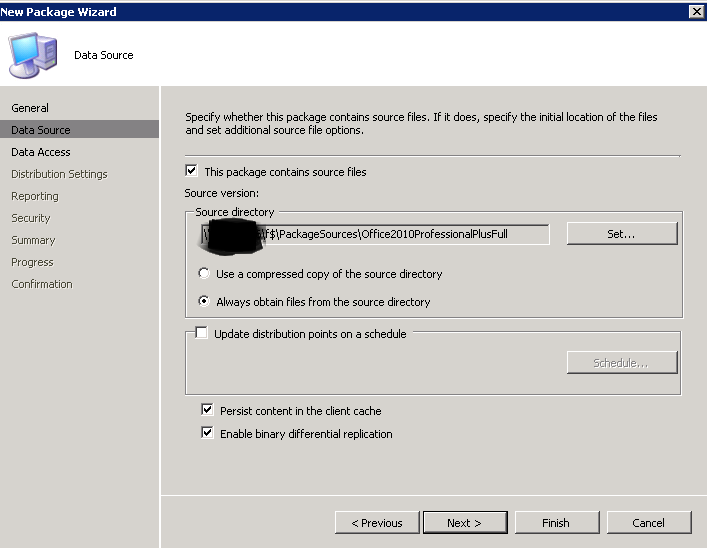 The SCCM agent will appear in the bottom right hand corner. Depending on how you advertised the application will depend on the icon. Below are the three possibilities that will appear. I set a deadline so the middle will appear, it will state an application will be installed in x amount of time. To see the progress on the advertisement run the report All Advertisements for a specific collection. It will list the current state of the advertisement. If you’re planning to move from 32 bit to 64 bit then you need to remove all versions of 32 bit first. In my case I needed to remove Microsoft Office 2007 Professional and a few other applications. Create a file in Pro.WW called SilentUninstallConfig.xml. Change any advance settings. 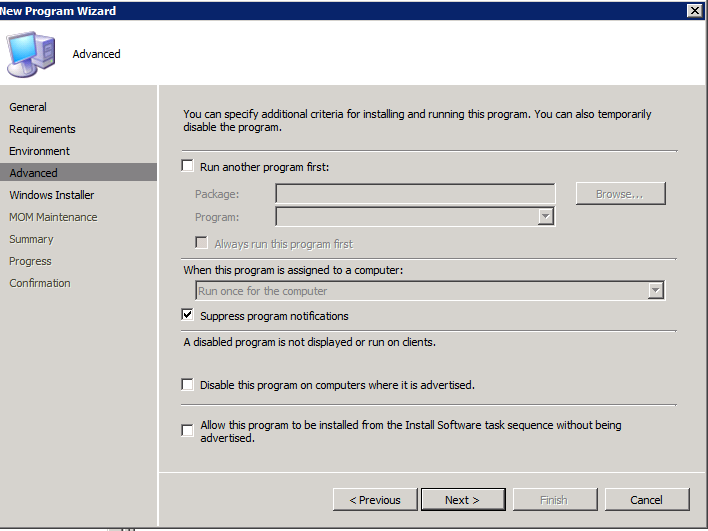 In this example, it will suppress program notifications. 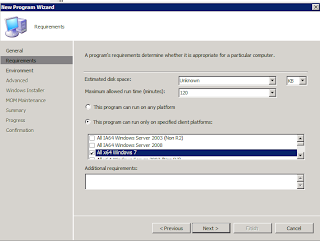 Create a Task Sequence that removes your applications and then installs Office 2010 Professional Plus x64. In Options for the task, check to see if the following register exists. This way it will only try an remove it if it is installed. Advertise this instead to your collection and your set to go. Set the Advertisement to only download content if required. This way it will not download Office 2007 if it is not installed. The Service Desk have an easy solution to install Office2010, just by adding the computer into a Security Group. They do not need to know anything about the SCCM console. They can tell the user they will get the application within two hours. We don't need to install it on the 1000 workstations yet. When management decide to deliver Office 2010 to all systems we could remove the deadline and advertise it to all active systems. If we remove new notifications it would be a self service. The user would see the application under programs and features and install it when they want. We could also set a deadline from one month of advertisement date and remind them every second day. This way they have a month to install before it installs itself. I hope you have found this blog helpful, please leave a comment or question if you have. I have some questions on your task sequence. For your removal tasks, what is in your package and how are you doing the removal? What will you do if Office was installed by a different MSI which resulted in a different registry key (GUID) that you are not aware? The condition on your task step might make SCCM believe that Office may not be installed because you only specify on registry key. The package is the package I used to install the application. The package has two programs, one to install and one to remove. I added the file SilentUninstallConfig.xml to the package and call this to uninstall the application. My task sequence checks for all versions in my network. For example, if I had Office 2007 Enterprise in my environment I would just include it. No Big deal. A quick SCCM report tells me all versions on my network. Hi Blair, not sure, but I think there's a small flaw in your deployment logic at the Office 2010 install stage. You've created your program so that it installs with admin rights whether the computer is logged on or not, but also allowed user interaction. 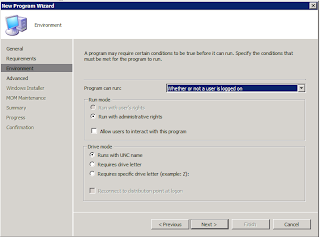 In the past when I've created a program that installs when the computer is not logged on but which permits user interaction I've found that SCCM refuses to install when the computer is in the logged off state. This is because it wants to let the interactive user have access to the install, but because the machine is logged off there is no interactive user and that breaks the policy of the program. The fix there is to only allow install when the computer is logged in I suppose. Great post though, especially with your use of the task sequence, nice! Thanks for your useful post. In my case i want to install office 2013 and uninstall office 2010 automatically. 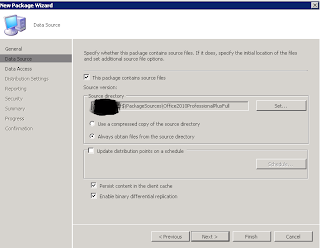 I did your steps from 1-5 to customize office 2013 and I have create a file in Pro.WW called SilentUninstallConfig.xml. What I need now, is how to do a batch file to combine between installing office 2013 with the msd file + and removing office 2010 with the config.xml.